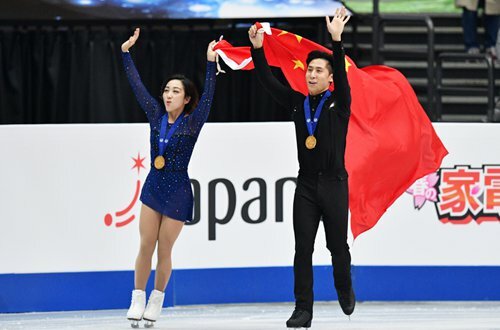 China's Olympic silver medalists Sui Wenjing and Han Cong took the pairs skating crown at the World Championships on Thursday after a breathtaking free skate at the Saitama Super Arena. Despite a season blighted by injury, the 2017 world champions skated a ­lyrical, moving programme for a season's best 155.60 (234.84 combined), drawing a packed crowd to its feet with their clean jumps and gorgeous lifts. "This has been a difficult year for us - we've had injuries and other issues," said Sui, who laughed as Han pumped his fists at the end of the routine. Russians filled out the rest of the ­podium with second place going to ­Evgenia Tarasova and Vladimir Morozov after a regal but mistake-marred program that included the latter putting his hand to the ice in the wake of their Triple toe loop. "In the free program it was tough and we had to fight for every single element," Morozov said after their routine, which garnered a season's best 147.26 for a ­total of 228.47. "It was totally different to yesterday. We were struggling to get everything right." Third place went to Natalia Zabiiako and Alexander Enbert, whose dynamic program earned them 144.02 and a combined total of 217.98. European champions Vanessa James and Morgan Cipres, favorites going into the worlds after an undefeated season, were only able to manage fifth. Frenchwoman James collided with Italian skater Matteo Guarise during warm-ups for the short program on Wednesday and fell after a botched landing in their routine. "Worlds hasn't been our best friend. I fell on the twist in the short program once and I fell on the triple Salchow before, but we know that each time we are getting stronger," said Canadian-born James. "I think we did our job today and we are never giving up. We won't give up until we get the world title," she said. The World Championships continues at the arena north of Tokyo until Saturday.